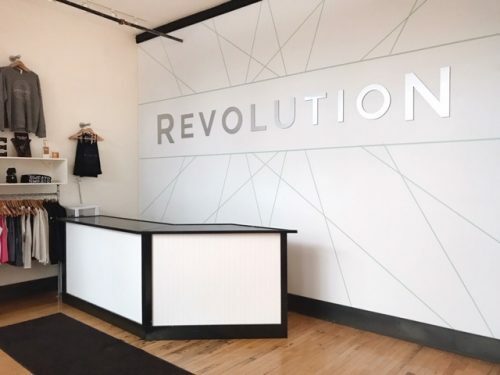 Revolution Buffalo is a fitness studio offering spinning, Indo-Row, and TRX classes in downtown Buffalo. They recently expanded their space to offer more classes throughout the week (there are more than 70 offerings each week! ), and teamed up with The Healthy Scratch to bring fresh-pressed juices to those looking to refuel after a workout. The three of us had been coaching in the fitness industry for years and had identified some areas where we thought we could take boutique fitness to the next level for Buffalo. Combined with our passion for sweat and community, Revolution was born! Why did you decide to launch a business in Western New York? Why wouldn’t you launch a business in the City of Good Neighbors?! We had a strong network here (Amanda and Rachel grew up in Buffalo, I relocated from Rochester for college) to help build and support our business, great mentors, and some helpful resources like Buffalo State’s entrepreneurship program and M&T Bank to help us get started. What was it like when you were announced as an Ignite Buffalo winner? It was thrilling! We couldn’t believe it! The timing was so right, given that we had big goals to grow our staff and space this year, and we were really excited to have access to mentors through Facebook, 43North, and Ignite Buffalo that would help guide us on the next step forward in this sweaty adventure. What has been your proudest moment since starting your business? It’s so hard to pick just one! From the big, spotlight moments, like winning the Ignite grant, to partnering with The Healthy Scratch to open their third location within the walls of Revolution, to overhearing one of our dads on the phone doing a “dad brag” about Revolution, it’s all amazing. What is the biggest challenge you face as a small business owner? One of our biggest challenges we face as a small business owner is how to keep our community-forward, hometown vibe as we scale for growth. It’s important to us that no matter how big we are fortunate enough to grow, that we don’t ever lose sight of the heart of what Revolution means to us, our employees, our clients, and Buffalo as a larger community overall. If the passion is there, 100% do it. Life won’t get easier (for a while at least), but it will be fuller, more meaningful, and more purposeful than ever before!